I have a terrible memory, there is no joy in my life, and I can't seem to put a day together (like clean my boat). I have so many notes that I think I make things worse. I broke my neck and back when my head was crushed all at the same time. I'm all put back together &mdash; fused at my t-1 through my t-5 on my back. I'm very active and am trying to still make a living for my family but having great difficulty. My income is a third of what I normally make. I know things are different for me but can't seem to figure it out and this is causing me more grief. Any suggestions? I don't even know if I'm asking what I'm trying to say or not but if anyone has any info I would be grateful. My son suffered a severe TBI back in June 2016. From the research I've been reading of late, aerobic exercise seems to play a big factor in neurogenisis and rebuilding connections. While it directly impacts motor areas of the brain, it also seems to help build connections between areas of the brain. Also, OMEGA 3's and DHA in fish oil also play a role, it seems. Hello Brent. Firstly I am so sorry this has happened to you and while I know it won't be any help for you to know this, I am sincere. I am 4 months post. Still have major memory problems. When I try to explain my difficulty to friends, they try to make light of it and say "Oh, I always forget stuff, too." I hate that. It diminishes my problem. It also feels like they are distancing themselves and makes me not want to confide in them anymore. Carol, have you tried telling your friends how their comments affect you? They may be trying to normalize the memory problem for you by joining in with it and not realizing how devastating it really is for you not to remember things. Letting them know how you feel may help them to understand your distress and how they can respond more helpfully. I'm glad you brought this subject up about "oh I forget too" because I literally said something similar to my fiancée. I'm reading all of these comments to possibly learn how to respond when, in my case, I was being honest about forgetting. I didn't realize the frustration in comparison. Be strong and I pray each day gets better for you! My ex husband checked off all of those then told me I wasn't normal enough... so now we are getting divorced. My tbi?...Epilepsy since I was little and low blood pressure makes for a lot of run ins with the hard ground. 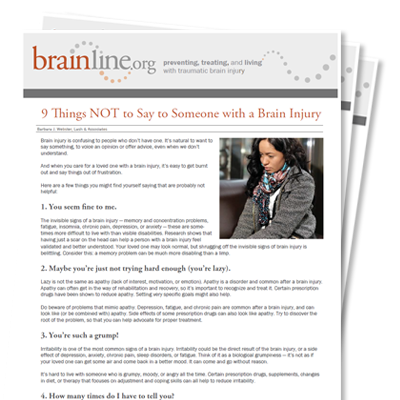 Add a tenth comment you should never say to a TBI survivor: "...Remember, (?) I told you..." I'm 6 years out from my major stroke and 3 years out from a 2nd, milder stroke. I have shared with friends & family how their innocent unthinking comment affects me and have offered alternative variations to them to get their 'point' across that sometime in the recent past I had been informed by them as to the subject being discussed. Reminding me that my short term memory has been compromised does nothing for my self esteem, especially since, if given a little time or cues, I WILL recall! I have a tbi and I constantly hear a variation of "You seem so normal," or "You sound like you're doing great communicating to me." Jeez!!!!! Do you know how frustrating and infuriating that is? It's like when they used to tell you crap like "You must have alot of girlfriends," or the infamous "You must be a heart breaker" when in reality you can't even make a friend due to the inabilities brought on by your TBI. I am a father with a TBI, it's been 43 years now since my stroke at the age of 18. In 2012, at the age of 17, my daughter was in an accident and suffered a TBI. I'm still dealing with the after math of it. Although she's high functioning, there's a lot of things she'll never be able to do again. My favorite, at work, by a guy who knew of my accident. "Don't be retarded about it." About materials used at work. I think he felt bad, cuz later came by to help me with something else, something he never does. I didn't mention the owie he caused. I didn't know how. Two years post accident. At least I'm working, pretty good at it too. My current favorite is "That's not very mindful of you." As a Buddhist there's not much which I take personally, but that one cuts me to the quick. I've had my tbi 5 years now. People just won't get it. Even those who are close to me. I love the way you write. Its very different. God bless you. I invite ALL who have passed judgment, not provided adequate medical or psychological care, accused previously high achieving, intelligent & competitive athletes of malingering, to live for ONE week with their economic means permanently removed, inadequate social & family supports, no restorative sleep, adverse effects of medication, loss of self identity, possibly homelessness...etc, etc. and see how it is. As a former medical provider, now a TBI patient most people would not even BELIEVE how we are treated. My heart goes out to all of us, told we will be better if we accept everything and "move on." Move on to what exactly? I 100% agree with you. I spent 14 years working on my brain because I love math and science, but after I took several blows to the head, I've been unable to recover. Not only was I forced to give up on everything I'd spent 14 years working for, but many people around me hounded me for months while I was attempting to get better, and deliberately put themselves in the way of my recovery while turning my brain injury it into a joke. Imo is this the number one reason why I'll never be able to recover as well as I should have, because I was completely unable to get any peace to do so. Many people are quick to pass judgement although some of the fastest-growing health issues, physical and/or psychological, are related to the brain, imo including "victim shaming and slander". It's imo mind-boggling that people can be so judgemental when it's a problem that's likely to one day occur to themselves and/or to someone in their own family given that it's one of the fastest-growing health issues. Considering the fact that many brain-related problems still go completely undiagnosed, it's likely to already be occurring to themselves or someone in their own family. It's imo a travesty how little a brain is valued, especially since it's claimed that we're in the knowledge-intensive age. After what I've personally experienced, I'm finding it difficult to agree. Well said, I read your post and thought finally!! I would like to add #10 - any statement/advice/criticism that starts with, "You just need to...". I have come to hate the word "just" and all that is wrapped up in it: simple, willpower, determination, self-discipline. Nothing is a "just" for me anymore. Nothing is simple. Nothing I have difficulty with is the result of a lack of willpower, determination, or self-discipline. However, it seems everyone is completely unaware of the hidden message of "just". What is simple for him/her and used to be simple for me no longer is. Thank you all for posting! I have been feeling the same way since my TBI in 2008 and really do not understand why I look like I am fine and at times can be active but later I am in intense pain without my medication I would be living in constant pain. And everyone hates me these days because I am not up to their standards nor do they care that I been injured. It's been hard thanks again for posting. I was in MVA 8 years ago, it took nearly 2 years for my cognitive functions to improve enough that I could make it through a job interview successfully although once landing the job it took several more years to develop compensation techniques like keeping a log of everything I work each day, phone conversations etc to help with my memory issues. After 8 years I still have difficulty concentrating at times and become exhausted from concentrating too hard or too long. If it weren't for the personal relationship I built with my employer I'm quite sure I would've been laid off. Recently some new issues have developed that have greatly impaired my ability to work, over the last 2 years I have rapidly developed a connection to the weather that causes my tbi affects to flair up. The same MVA I hurt my knee and developed arthritis. The best I can explain what has been going on is basically arthritis in my head/brain. When it is cloudy/rainy/humid I feel excessively fatigued and often oversleep and will need several hours to feel coherent enough to shower and get ready --- leads to an afternoon arrival at work. I will continue to feel groggy & slowed mental processing, I hear myself on the phone with clients and I struggle to put together my thoughts and have difficulty articulating well. I may simultaneously have a migraine or I could just stay in this limbo for the next day or days until the weather front moves out. My light sensitivity has also increased dramatically during this same 2 year time frame, the weather also heightens it but it exists all the time, I live in sunglasses. Working in an office the light from the computer screen irritates my eyes after several hours. The combination of fluorescent lights and the computer screen are unbearable and cause painful migraines, I had to bring in a tall house lamp for my office but most of the day don't turn on the lights at all. However my work requires me to visit clients and sometimes work onsite where I don't have control over the lighting. God forbid I'm scheduled to see a client during bad weather-- I won't be able to show up until the afternoon and my concentration and ability to answer questions coherently are greatly impaired. Somettimes I am so dizzy and disoriented from the weather that I am not comfortable driving. I recently went to see a neurologist but she couldn't grasp that I have a connection to the weather or that half the time I have the fatigue, light sensitivity, dizziness but they wont be followed by a migraine. The only meds she prescribed are to prevent and treat migraines --so far in 10 days no migraine but there's been 3 days of overcast/rain and all the other symptoms continued to persist despite the medication. Does anyone else on the planet have a similar reaction to the weather or am truly the medical oddity the doctors seemed to be perplexed by? I also have extreme fatigue post TBI that seems to be weather related. My issues are worse when it's hot out. It's been 20 years since my MVA. My biggest struggle is how easily I get frustrated and cry. I can cry at the drop of a hat. It's hard to be professional when I can't control my emotions. True to talk to my doctor and she says, " everyone is like that." Hi - I am 16 years and I also have strong weather-related issues. You are not alone. Doctors ar enot educated about brain injury. Google emotion after brain injury or emotional lability after brain injury or something like that, find something that points out what a big problem it is and give it to your doctor! "Was your brain injury self-diagnosed?" -- This from a psychiatrist. I am 21. When I was 19 years old I had my severe brain injury. With two different bleeding spots on my brain, temporarily paralyzing me, breaking my ski helmet, 3 months of no memory at all around that time,and literally smashing my cheek and nose inward. All of these statements are so true. I absolutely hate it when anyone makes those statements to me. I'm constantly being yelled at by family, coworkers, bosses, and everyone likes to act like they understand. No one comes close to understanding what it's like to basically jump into someone else's body. 16 years for me and I feel as if I'm getting worse. Memory has not gotten better and I'm getting where I won't leave the house unless I have to. Don't like being around more than a few people at one time and when people ask me random questions I get lost. Accident was 1/21/2001 age 19 and I get so frustrated when everyone thinks I shouldn't have any problems since its been 16 years. I hate,"oh come on it's been years you know your memory isn't bad anymore" and "well everything should be better you look great." Please, please seek some professional help with this. Maybe your wife and you can go together. Have you told her all of this? Has someone explained to her how TBI' can affect you? You say you don't have insurance. Not sure what state you're in but in Texas we have Department of Assessment and Rehabilitation Services (DARS). It is a state program specifically for TBI and SCI patients. Maybe your statenhas something similar that can help you get the help you need. You have a purpose. It may take a while for you to figure out what that is now. Praying you find the answers. I was in a head on collision 6 weeks ago. One ton chevy doing 65 ran into me doing 30. I walked away. Beaten and sore and slowly. went back to work 10 days later. again, slowly. I've been noticing more and more a difference in ME. It takes me much more time to get thru tasks. I can't ell anyone though. You MUST tell someone! There's nothing to be ashamed of. I relate to what you're saying. It can feel so isolating. I think its horrible. Just some of the times I hear I look fine but I'm putting on a good act. I feel so hurt. Good luck. I've had my tbi 17 years now. People don't get it. My mom doesn't even get it. I was in a bad car accident November 3rd in Iowa and lost 2 sisters; my mom broke her rips, her scapula, and had a gash in her head. My 4 year old sister had a minor brain bleed. I was left internally decapitated, had multiple brain injuries, broke my nose, and had blood behind my eye. I finally woke up from the comma November 24th one of my sisters that died's birthday. And my left lung collapsed. I've gotten better so far but I'm still very mentally not there. I get irritated easy, I can't control my anger, or my feelings. It's now march 14th 2017. Even though it's only been a few months it's still hard for me to handle everything. My education is back to normal I'm back at my age level for schooling. But she said I'm acting like a 4 year old. She really just doesn't get it. I had a freak accident which caused a Carotid dissection which induced a Stroke when I was 31, paralysing my left arm and causing a huge long list of physical and psychological problems, that was three years ago and I can't barely remember what life was like before the Epilepsy and panic attacks. My friends and family try to deal with me and all my weirdness but it's tough. Fear and depression now dictate what I do, I turned to alcohol and if seemed to help at first, I thought I'd found a cure, though all that happened was I got really fat and unhealthy. This is the first post I've read where people my age talk about having a stroke. In a weird way it's nice to know I'm not the only one, thanks. One other thing I'd like to mention is that I've been surprised to experience some hostility from people who resent the fact I don't work and I'm on disability benefits despite being able to walk and talk. I agree with all of these; I was injured in an MVA Oct 2016 and am Just getting used to some of the effects of my TBI. I was (and occasionally still am) very fearful about what the future holds but realizing I can only do what I can do, and slowly pushing past my boundaries / retraining myself as much as possible. The "all your medication is the problem" is the one that gets me the most. I would not be able to live if I didn't take it. It is so good to find out that others have been through the things that I went through. I have a friend who has a TBI injury 30 years ago. I definitely see signs of apathy memory issues motivation and coordination issues. His family is in denial. They think he can go out and get a regular job like a regular guy. I don't see this ever happening. He is very good looking man and is on SSDI. BOTTOM LINE. ..They don't want him as burden. . Even though family has lots of resources. Any suggestions or anyone relate to this. I totally understand your frustration i recently suffered a concussion through a slip while out running but was put into the brain injury box which is frustrating and in my view does not see the person but only the tick the box things that cover others. Don't ever lose your own sense of worth and dignity you are not making things up and you will have a future its very different for the individual who is going through the process i got a nine page document with the most horrendous "things that you will experience" by bullet point which i took great pleasure in shredding but not before it had got me really upset. Keep positive my friend don't let others drag you down. Great list, though I do not personally like being told I am strong or brave for having survived what someone else did to me. It does not take strength or bravery to survive a mild-traumatic brain injury, or to live with a stutter, cognitive issues, sleep deprivation, mood swings, headaches, tinnitus, or the back injury I sustained at the same time; all it takes is for someone to not look both ways before driving their car across the highway and into my motorcycle. Instead of calling me strong or brave, just acknowledge a preventable thing having happened, and the associated permanent injuries have changed my life forever. I do not want to be brave or strong, anymore. I am 17 years old. I've played contact hockey all my life and got hit in the head 3-4 times average each game. At first I didn't have any signs of brain damage but through the years I have 70% of symptoms (irritable, forgetfulness; more than the average person), concentration issues, insomnia, anxiety, depression, headaches that get worse, sudden blurred vision... the list goes on but I cant remember them all. And I think the worse of it all is that all my doctors are brushing it off as its all in my head and there's nothing to do about all these problems as my grades at school have dropped so much I fail all my classes... even the ones people take for an easy credit. i seriously don't know what to do anymore. You'll want to find a place that specializes in neuro rehab. Depending on the severity of his accident, there are inpatient neuro rehab hospitals across the country that provide 3 hours of therapy a day while also providing medical and nursing care. If the accident is less severe, there are outpatient physical therapy centers that specialize in neuro rehab for speech as well as occupational and physical therapy. You can start my googling neurological rehab centers near you. Or, if his case is very severe and he wouldn't yet qualify for a rehab hospital, long-term acute care hospitals offer a lesser amount of rehab, focusing more on medical needs. If his insurance won't cover that, you'll need to search for a nursing home that offers rehab services. Hope this helps.